My daughter really loves cooking. She’s been mixing things together since she was itty-bitty, and now that she’s older, it’s time to get her in the kitchen for some real cooking. Well, actually, our craft table has recently been taken over with lots of cooking activities, with some pretty awesome results. I’m always trying to find ways to introduce brain-boosting foods to my tot, making tuna an ingredient high on my list of yummy stuff. But sometimes my daughter isn’t so excited about fish. 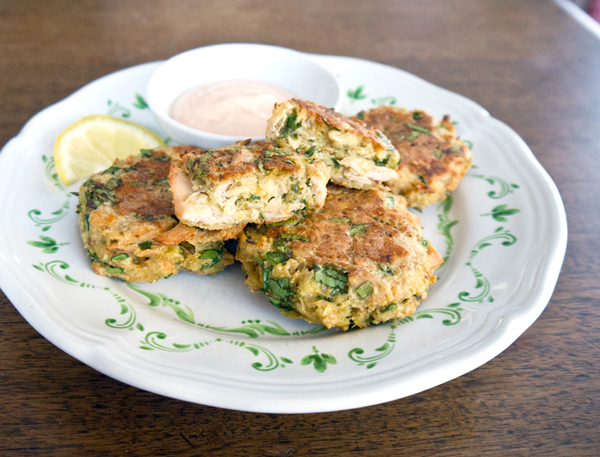 This recipe for tuna cakes is so easy and the results are delicious. And even if your little one isn’t a big fan, you just might be surprised to see her noshing on these after having a hand at making them. 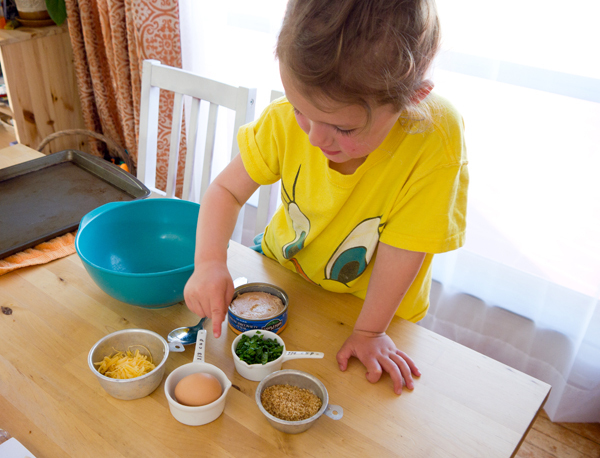 When cooking with kids, prep by getting all the ingredients ready before starting. For younger ones, pre-mesure the ingredients, chop and shred, and have in small containers along with mixing spoons and bowls at the ready. 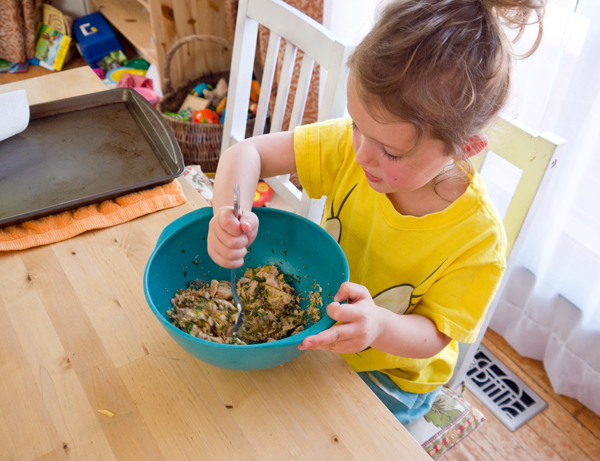 Older kids can help prep and even assist chop and shred with some adult supervision. After washing our hands, and getting all the ingredients ready, I asked my tot about what she saw in front of her. It as simple as dumping everything into a bowl and mixing together. For some kids this can take three seconds, or for others, like my daughter, this can turn into a 30 minute cooking segment. We used our favorite brand of tuna for these cakes and whole wheat breadcrumbs. When cooking together we have a rule that there’s no taste-testing when an egg is involved. We added a few dashes of salt and pepper, a squeeze of lemon, and the garlic. Then it was time to stir, stir, stir. The tuna cake batter will still be a bit moist, but, have no fear, these cakes are wonderfully delicious without being full of fillers. Preheat your oven to 400˚ F and lightly coat a sheet pan with vegetable oil. 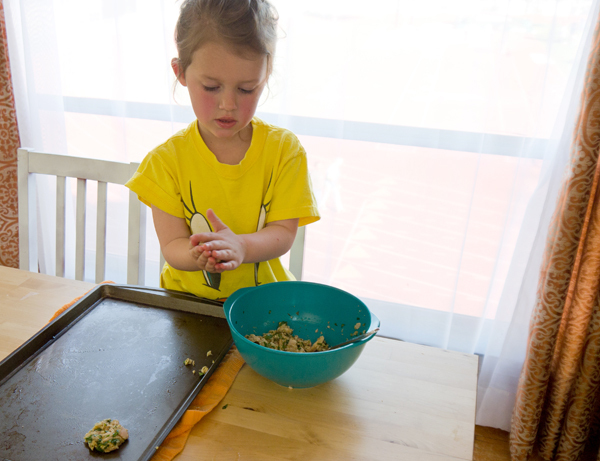 Now your child can scoop spoonfuls of the mixture and press together to create round patties, and then carefully place on the pan. You’ll have enough to make around six tuna cakes. Once your oven is nice and hot, toss those cakes in and bake for seven minutes and then gently flip. 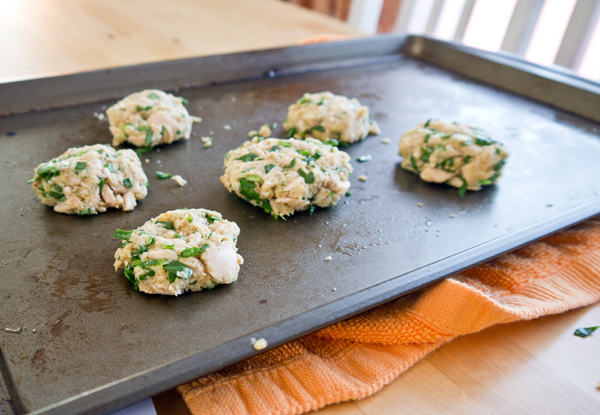 After baking for an additional three to five minutes those tuna cakes are ready to eat. 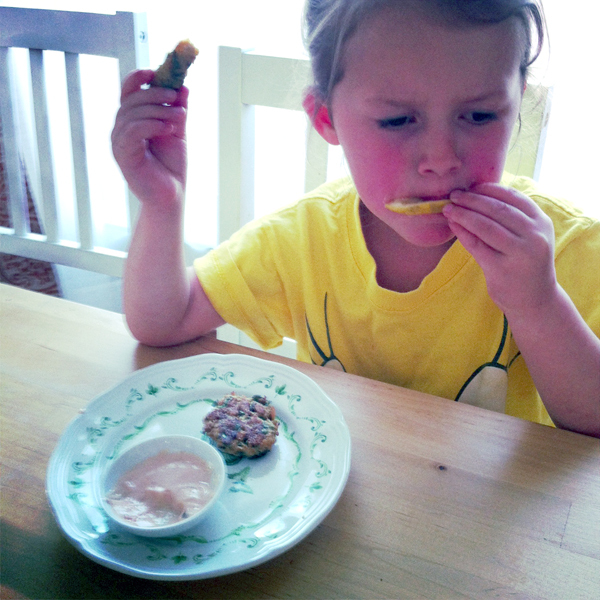 I served our cakes with a side of special dipping sauce (equal parts plain Greek-style yogurt and ketchup) and a slice of lemon, which my daughter really enjoyed sucking on after each bite (as you can see from the picture below). And you can add other ingredients to these tasty cakes, such as finely chopped green onion, swap pepper jack for the cheddar, or add a handful of corn — whatever your child likes. I just made this for dinner for my 3 year old and I and it was pretty good! Thanks for the recipe!